The 16-port, 256-channel Envoy meets the demand for lower cost, higher port density, and greater flexibility in wide-area networking (WAN) equipment. The Envoy's 16 independent HDLC controllers support up to 128 channels on a single port, and a shared DMA controller provides service for up to 256 channels simultaneously across the Envoy's 33MHz PCI systems interface. The device supports serial PCM channels at sustained rates of up to 132Mbps full-duplex, aggregate throughput. The Envoy also performs all HDLC-based Layer 2 processing, including zero stuffing and destuffing, flag generation and detection, CRC generation and checking, interfill, and abort generation and checking. It can sustain full-duplex data rates up to 52Mbps on each of its three high-speed ports and up to 10Mbps on its 13 standard ports. This device supports channelised operation at several user-selectable rates up to 8.192Mbps, allowing it to aggregate up to 64 T1 or E1 links simultaneously. The DS31256 Envoy has unique over-subscription capabilities that are suitable for DSLAM applications, and all ports support gapped clocking to simplify SONET/SDH overhead termination designs. The DS31256 transfers processed data to host memory using the PCI interface and employs time-stamped descriptors for received packets to give the host real-time information not available from other suppliers. add/drop multiplexers, HSSI/V.35 links, wireless base stations, and VPN equipment. 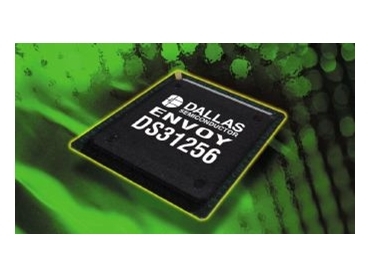 The DS31256 Envoy is a versatile and robust product that offers customers high performance, low cost, and high confidence in first-pass success. It complements Dallas' highly integrated T1/E1 and the latest T3/E3 products to form line card-level solutions. In addition, the Envoy is both software and hardware compatible with the DS3134 CHATEAU. The low-power 3.3V DS31256 has 5V-tolerant I/Os and comes in a 256-pin PBGA package. A complete evaluation kit and reference design are available, including a CD-ROM with a PC-based graphical user interface and device driver code, and a documentation package.